There and back again – topocreator county map showing my outbound route to Clemson in blue and my return route to Birmingham in red. 17 counties traversed on the outbound route, 18 counties traversed on the return route. Click to enlarge and see detail and annotations. I was close to finishing the series (40 more pages of the Return of the King) before leaving out my door on Friday for a 756 mile adventure to Clemson and back hitting the highest points in Alabama and Georgia on the way there and the highest point in Alabama again on the way back. I arrived back home through the same door just under 71 hours later. That’s over 1200km (the distance of the Paris-Brest-Paris randonneuring event held once every four years in France) in under the time cut-off of 90 hours for PBP. Along the way, I climbed nearly 60,000 feet of my favorite terrain – hills, hills, and more hills. I dropped Kristine and the kids off for their adventure down to Disney World on Friday afternoon after driving down to Alabaster in Friday-before-spring-break rush hour traffic. Two hours later, I made it back home and took off with my friend Michael Staley to ride up and over Cheaha together. We left Birmingham around sunset and made it to Cheaha just past midnight. Michael had brought a portable sleeping hammock so he decided to call it a night at the end of 281. I continued on wanting to hit the Alabama, Georgia, AND South Carolina state high points in a single ride and still make it to Clemson for my hotel reservation Saturday night. I was wide awake and ready to continue but running low on battery for my lights, so I rode without a light at all for many, many miles on beautifully paved Hwy 78 through Heflin and then even after turning onto a county road, the full moon was bright enough to see any obstacles in the road (of which there were very few). I saw two cars the entire time, and both of them came up from behind me so they could see my reflective clothing and blinking taillight. It wasn’t until I crossed over into Georgia, and the pavement went downhill pretty quickly that I turned my front light back on. I had to keep it on for the section of the Silver Comet that I rode from Rockmart to Dallas, which is quite dark and tricky at night. The big tunnel outside of Braswell was cool, although I was hoping for pitch black and spooky – instead it was very well lit. Michael Staley and I leaving my house in Birmingham and about 5 hours later on top of Mount Cheaha. By morning I had made it to the Kennesaw area northwest of Atlanta. Unfortunately, there was a lot of Saturday morning traffic from Kennesaw all the way until I hit 9 to head north to Dawsonville. Traffic died down a bit there, but was still busy. I’m sure there were better routes, but I was trying to find a somewhat direct route and ended up on quite busy roads. I noticed one of the segments on Strava was called “Try not to get hit”. The stretch from Dawsonville to Dahlonega was pretty much deserted, which surprised me as I thought that would be pretty busy, too. And, I was running so far behind and with the weather and rain moving in, the stretch of US-19 and GA-60 from Dahlonega up to the top of Woody’s Gap was quieter than when I rode it after Southern Cross a few weeks ago. I had my first extended stop 254 miles into the ride at the Dahlonega Dunkin Donuts, where I ate a bunch and charged up all my devices using wall chargers. 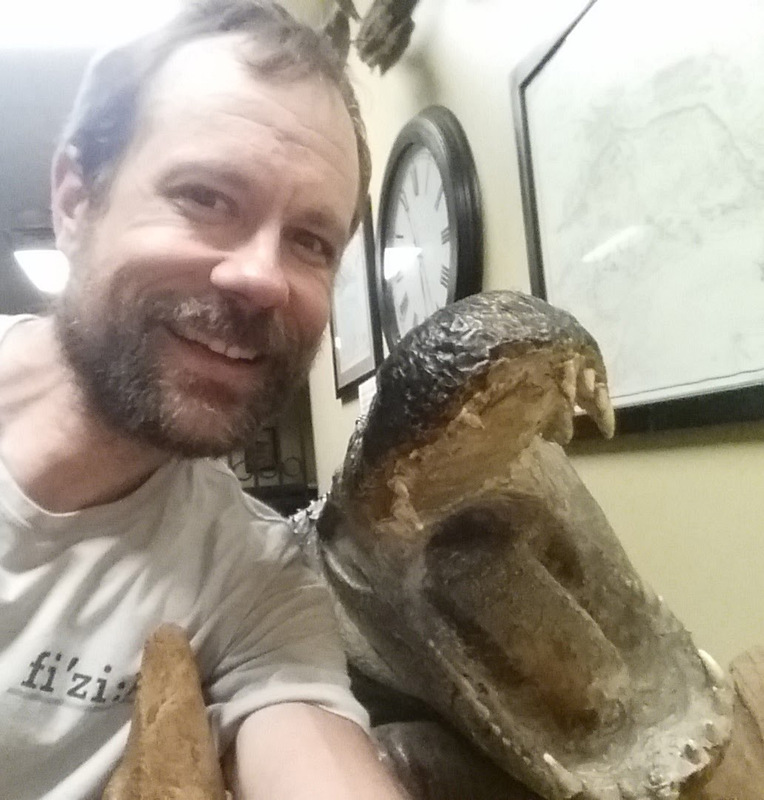 I met Adam Heiser from Atlanta who had driven up with his team to train in the mountains. That’s what so cool about Dahlonega – it is a true cycling destination – people come from all over to train and ride. Although, I’d like to think I’m the first person who has ever ridden there from Birmingham on a single ride! It was getting dark and quite cool in the high mountain valley between Woody’s Gap and Hogpen Gap so I had to put on my long sleeve rain vest to keep warm. But by the time I made it to the valley at the foot of Brasstown, it had gotten quite warm again and I had to stop and take off all the extra clothes. The temp dropped as I rode up into the clouds and rain so that it was down into the 40s by the top. I made it to the top about 15 minutes too soon, as the park rangers were in the process of leaving. They were still there, though, and they told me I couldn’t ride my bike to the top so I took off hiking up to the top (1k up and 1k back down) in my speedplay cleats. They were gone by the time I made it back down. I’ve ridden to the top of Brasstown many times, but always in weird off hours when the park is deserted and there are no park rangers up there. I understand their concern as it is against the rules, and it is a dangerous climb when the shuttle busses are running because of how steep and sharp that first switchback is, but when everything is deserted and there aren’t any shuttle busses, I don’t see what the problem is all about. Rules are rules, I guess, and some people don’t understand that there is a purpose behind every rule and when conditions invalidate the purpose for the rule, the rule itself should not be enforced. Still, since the park ranger said the park was closed, I was grateful he let me in at all so I could hike to the top. Although I don’t really understand the concept of closing or restricting access to public lands. At this point, I was planning on instagramming some of the pics I had been taking and then using the hotel computer to upload my ride to strava. But I fell asleep holding my phone after showering and didn’t wake up for four or five hours later. At which point, I said forget it and just slept for another three hours getting up about 8:30AM eastern time, 7:30 central time (which is the timezone my body stayed on the entire ride). Thankfully, I had plugged in a number of my devices into wall chargers, but I still needed to charge my lights so I did that during breakfast and while I uploaded my ride to strava from the hotel computer. I had brought my Di2 charger with me, knowing that my Di2 battery wouldn’t last the full 750 miles with the D-fly attachment which drains the battery fast. But I hadn’t connected it right and it only charged back up to 50% by the time I left. This barely got me back to Atlanta the next day, where I thought I would have to spend the night but thankfully I got it charged during an extended stop at Starbucks at the Vinings exit on 285. I was expecting rain on the way back, and the weather didn’t disappoint. Fortunately, I made it almost all the way to Gainesville, Georgia (90ish miles into the ride back) before it started to rain. Then it rained pretty much all the way down to Atlanta where it had stopped by the north side of town. The sun came out a bit right as it was sunsetting. Then it was dark and I followed a lot of cool greenways to make it to the Starbucks in Vinings which I had been thinking about for the past 130 miles on the way there. I had two of their new Spicy Chorizo breakfast sandwiches, a venti caramel macchiato, and a venti coffee. I needed to charge both my garmins, my Di2, and my lights. I stayed there for close to an hour and a half getting caught up on instagram pics and waiting for things to charge. Then I took off hitting the Silver Comet and riding it and the Chief Ladiga trail for the next 96 miles to Weaver, Alabama. This was fun, but I would definitely like to experience it again when it isn’t full of huge puddles, debris, and very dark. I made it to Weaver by about 5 in the morning about an hour and a half before sunrise when my last light died. So I crossed 431 and headed to the gate and was stopped by a nice soldier, who I told I was trying to make it to the Anniston bypass. He said I needed to head one gate farther down, so I turned around and took 431 south for a mile or so to the next gate which is unmanned and rode through Fort McClellan with no light until I remembered I still had a little bit of charge on one of my battery packs. I plugged it into my light and that gave me about 10 minutes of riding until it died too just as I made it to the Anniston bypass. The new section of the bypass is open now, and it is heavily used even before 5:30 in the morning . 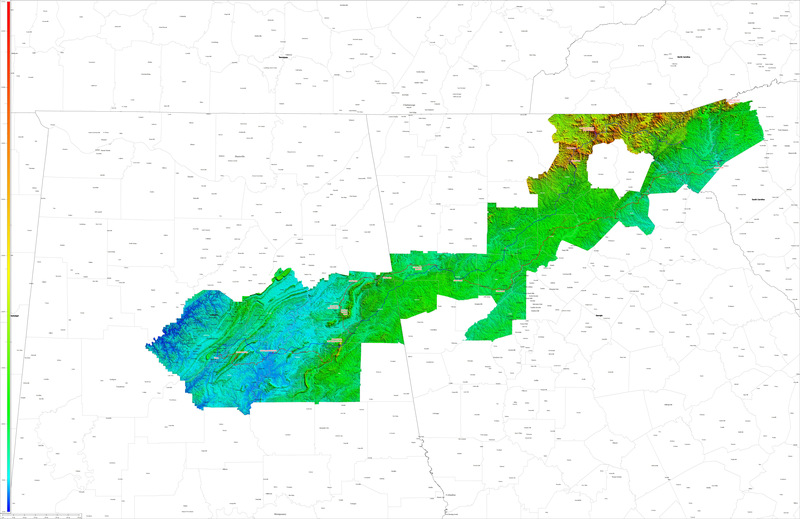 Weaving up cheaha – not ashamed – brings back memories of when we used to do the cheaha challenge with an 11×23 cassette. Traffic dropped to pretty much zero as soon as I crossed I-20 and hit the friendship road climb up to the parkway. I made it to Cheaha mid-morning and weaved my way up the entire climb (see pic above). I was pretty exhausted by this point but I wasn’t the least bit sleepy. Another issue at this point was saddle sores. Because of all the rain, I had some pretty nasty saddle sores and raw areas even applying lots of the Vitamin A&D ointment at every extended stop. I should have taken one of the men’s adult diapers. I had thought about it, and regretted it for about 12 hours from the middle of Georgia until home. Plus, they don’t sell small versions of those things – you have to buy a 12 pack or larger so I was stubbornly not going to buy any since I only needed one. Oh well, I’m still paying for it several days after the ride. Both my Garmins were about dead by the time I made it to Talladega, so I ran into the Walmart and bought a FOURTH powerbank that was precharged so I didn’t have to wait for devices to charge before heading back to Birmingham. Still, I ran out of charge on my Garmin 800 by Chelsea after draining the powerbank charging up my phone and Garmin 1000 too much (it charged quickly). So I had to stop AGAIN and charge my Garmin 800 in an electric outlet on the back of a gas station. I would have charged at the Chelsea sonic which has been an oasis for many of an adventure but I couldn’t find any electric outlets at all so I kept on riding until I got to a gas station where I found one. The last big challenge of the ride was convincing myself to do the Double Oak climb. If I had been able to climb Sassafras on the ride on the way to Clemson, there is absolutely no way I would have done the 7 mile detour and 1000 foot climb to the top of double oak from chelsea. I would have ridden as straight home as possible, but given that I missed Sassafras I wanted to at least put double oak on the elevation profile for comparison with the other big climbs on the ride. I was running an 11×32 cassette with a 39 small chainring so I could just spin up the climb and weave up the steeper parts. I was in no hurry as my family was all in Disney World and I just needed to get back eventually so I just took my time. By this time it was quite hot and I was getting sunburned. It was amazing to me that I could experience dry cold, wet cold, wet hot, and dry hot all on the same ride. That puts the scope of the ride into perspective for me. The other thing that puts it into perspective is this view below looking off the double oak cliffs back in the direction from which I had come from Clemson … about 250 miles as the crow flies, 360 miles as the bike rides far, far, far, far beyond the horizon. View looking back in the general direction of Clemson beyond Signal Mountain – far beyond the horizon visible in this pic. I took 285 pictures during the ride, and I’m currently working on a way to display them all on my interactive topocreator maps. In the meantime, check out a selection of the pics separated into two galleries – “there” and “back again”. Also, I have lots of data and analysis to post and lots of comparisons to RAAM that I want to comment on, but I will save that for another post. Thanks for reading! Dropping Kristine off with the kids for a Moon – Toone Disney World vacation over spring break! Michael Staley and I leaving from my house to head over to Cheaha together. Sunset from atop of Vestavia Dr. I wanted to include this climb at the beginning of the ride to compare to Cheaha, Brasstown, and Sassafras later in the ride. See elevation profile at the end. Home and the Vulcan from Vestavia Dr.
Alabama’s highest point – Mount Cheaha – Elevation 2407′. Michael and I at the top of Alabama! Garmin screenshot on the Silver Comet trail shortly after Rockmart. Note the 38.1 degF temp. Garmin screenshot #2 at the same spot. The only thing this adds is the time – 10 hours, 44 minutes to get from Hoover to Rockmart via Mount Cheaha. Lots of cuts through the mountains near Braswell. Another rider up early and on the trail. The Braswell tunnel on the Silver Comet. A bike lane near Kennesaw Mountain. Kennesaw Mountain from a busy road. Kennesaw Mountain with a quarry in the foreground. The Dawsonville square – no pics in between because traffic was heavy for a long, long time and not safe to take pics even. Nascar race car in the town square. Information about Dawson County in the town square. I think this was a dog skull where I stopped to pee between Dawsonville and Dahlonega. Auraria, Georgia – straight out of the walking dead it felt like. Information sign about Auraria, Georgia. First glimpse of the mountains of north georgia. The top of Woody’s gap. Looking back south at the Appalachian trailhead from the top of Woody’s gap. Starting the descent down Wolfpen. Looking towards Brasstown from Wolfpen. The top of Jack’s Gap at the start of the 3 mile steep Brasstown climb. I had to weave. It rained a bit, and I reset the Garmin when it hit 130 miles about 2 miles up the climb. The temp was falling rapidly at this point, and it would be down into the 40s just 1 mile later! Second garmin screenshot – 9 hours and 32 minutes from Rockmart, Georgia to 1 mile from the top of Brasstown. Informational sign at the top of the hiking trail to the top. The lookout tower at the top. Closeup of the lookout tower. There was nothing to see upon looking out as everything was covered in clouds. 292 miles by the top of Brasstown. The Appalachian Trail at the US-76 crossing outside of Clayton. A tiger paw on the entrance road to Clemson. The new westzone of Death Valley. I used to run stadium steps here. The huge tiger paw on the side of the stadium. Howards Rock at the football player entrance to the stadium. The large sign above Howards Rock. The clocktower of Tillman Hall – when I would ride 200 miles at the end of each racing season at Clemson, I would take a picture of the clock before and after the ride. It was fun to take this pic and the next one which shows the time. Final Garmin screenshots in the hotel. Final Garmin screenshots in the hotel – 7 hours, 20 minutes from the top of Brasstown to the Holiday Inn Express in Clemson. My bike in the hallway outside the room. Actual distance was just under 378 miles, note the 0% battery as the Garmin 1000 died on campus as I was taking pics around campus. I took this screenshot after plugging the Garmin 1000 into the wall. Thankfully I didn’t lose any ride data since the Garmin 1000 has all my Di2 shifting data. The elevation profile for the 376 miles from Hoover to the Clemson University campus. Note that the very first tiny climb is the 700 foot climb up to the top of Vestavia Dr. The next small humps are the Hwy 25 climbs including the steep side of Vandiver. Then the next climb is up Mount Cheaha. Then the next major climb is Woody’s Gap, followed by the small Wolfpen Gap climb from the high valley between Woody’s and Wolfpen. Then you have Brasstown Bald, followed by a somewhat significant climb on US-76 back up to the Appalachian Trail followed by lots of steep smaller climbs all the way from there to the final drop-off from Stumphouse mountain outside of Walhalla. All the hills between there and Clemson don’t even show up at this scale. Hotel selfie – all packed up and ready to go. The main approach to Tillman Hall from next to Bowman field. Riggs Hall – the old Electrical Engineering building – I spent a lot of time here! The shoeboxes! I lived here for a year. Lake Hartwell – I proposed to Kristine almost 15 years to the day at this spot watching the sunset over Lake Hartwell. Lots of Easter services in rural churches in the corner of South Carolina. Cool 3D looking tractor sign. The windy, hilly road ahead. 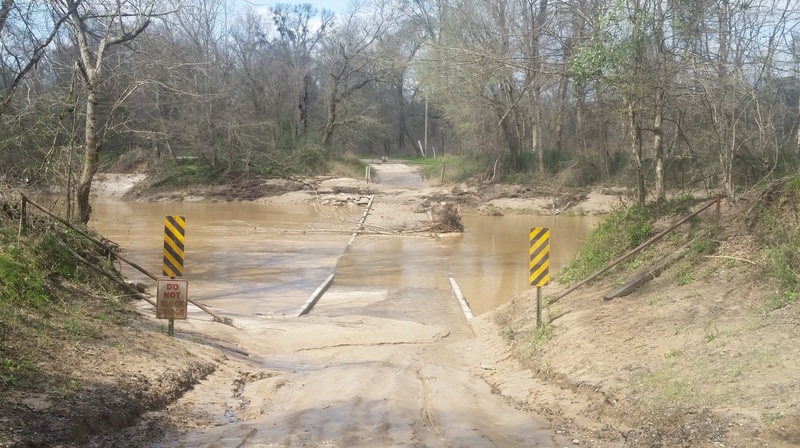 Old Hwy 123 bridge turned into fishing pier. I think Lake Hartwell is a bit too deep to ford. The new Hwy 123 bridge in the distance. Looking back at the Welcome to South Carolina sign just before crossing into Georgia. Looking back at the old Hwy 123 bridge turned into fishing pier. The Georgia state line and Welcome to Georgia signs. Mount Currahee in the fog. Another view of the Mount Currahee mountains. I stopped here because I didn’t want to continue on the gravel road which I hit quite suddenly. I had just tucked and was flying along at 45 mph when out of nowhere the road went from perfect pavement to rough gravel. I had just enough time to slam on the brakes and hit the gravel at maybe 20mph. Thankfully I didn’t pinch flat and decided with the rain starting that I’d probably be better to stay on pavement. So I turned around and the took the state highway alternative route. Lots of dogwoods blooming in the woods. In the afternoon, I stopped underneath an awning at this church to cover my Garmins from the rain and took this picture of the cross and hills. Rabbittown cafe for a quick lunch/dinner. I stumbled upon this Forsyth County trail and decided to take it instead of the route I had planned. Mt adams mountain bike trails. Made it to the Starbucks at the 285 vinings exit. Resetting the Garmins at the Starbucks. 154 miles, 10 hours and 46 minutes from Clemson to the Starbucks at the 285 vinings exit. Shortly after Vinings, I hopped on the Silver Comet and rode it a long ways. This section outside of Cedarville was amazing with steep hills – clearly not a rails-to-trail section of the trail. The Silver Comet goes right through the middle of the Cedartown, Georgia amtrak depot. The Esom Hill crossing very close to the border of Alabama. Chief Ladiga trail at the Alabama state line. 10 miles into Alabama, I came across this tree blocking the entire trail. I had to climb over an embankment and walk through a field to get around it. The Chief Ladiga trail goes right through Jacksonville State University. There was a short section near the very end of the trail that was closed. I took the detour and then picked up the trail again about a mile from the end. Welcome to Weaver near the very end of the trail. I stopped at the Oxford McDonald’s to recharge my Garmins and get breakfast. Screenshot. 7 hours and 56 minutes, 110 miles from the Vinings starbucks to the Oxford McDonald’s. The steep climb up to the Cheaha motorway. The first steep climb on the motorway. The horseblock overlook towards Cheaha, with the top of Cheaha still in the clouds. A panorama from the horseblock overlook. Looking down at the front of my bike while climbing. Looking down at the back of my bike while climbing. Crossing the Pinhotti Trail near the top of Cheaha. The lookout tower at the top of Cheaha. 284 miles from Clemson, South Carolina to the top of Mount Cheaha. The west side descent of Cheaha, which I everested a couple years ago. One of my favorite views in Alabama towards the bottom of the west side descent. Looking back at mount cheaha from the Adams Gap climb. The Adams Gap climb where the pavement ends if you continue straight. 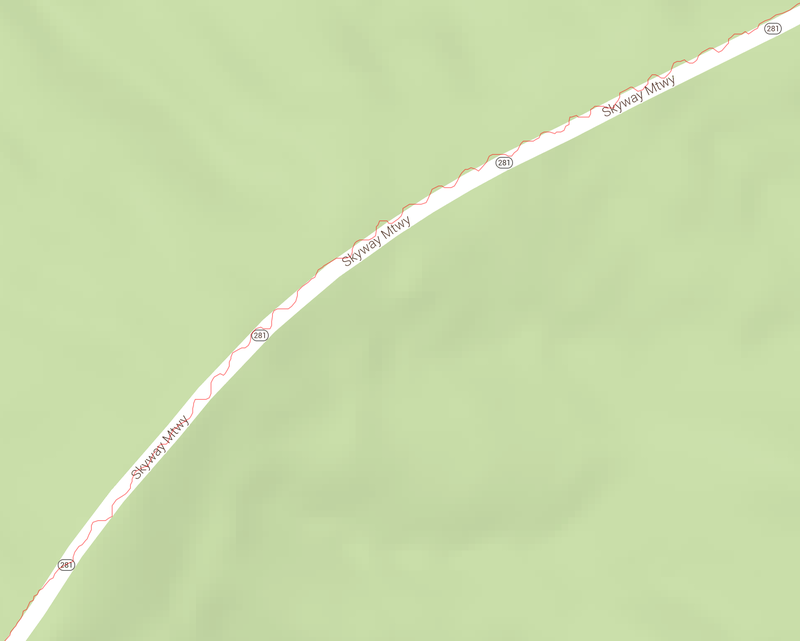 If you turn left, you have a 2 mile rough descent down into Clay County. 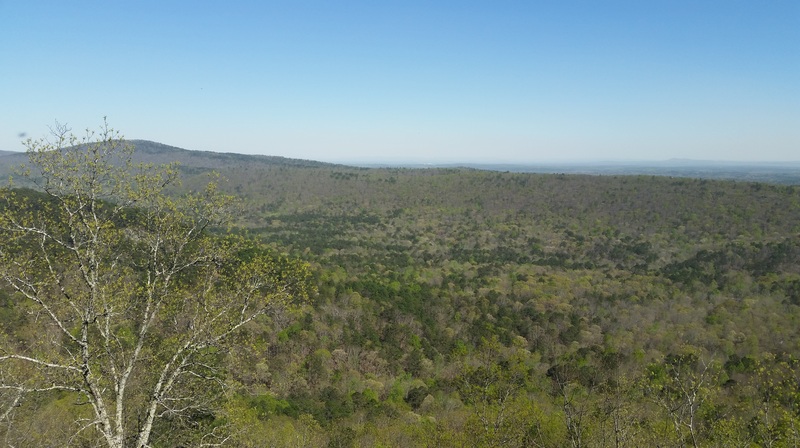 The plateau in the distance has amazing views looking back towards Cheaha. Markings on the ground from last year’s Skyway Epic race. This ride was definitely epic! I bought this powerbank to try to get home without having to stop again to charge devices, but I still didn’t make it and had to stop one more time to charge the Garmin 800. The renfroe tower sleeping giant. Finally back in Shelby County, the last county to traverse to get back to my house. Plugging along, quite hot by this point. I almost stepped in some poison oak when I took a pee break outside of Vincent. Gas station stop to recharge the Garmin 800 … might as well have another Red Bull! Noticing how large the holes in my backpack have gotten. Dogwoods on the double oak climb. Microwave and cell tower on top of double oak. Weather radar on top of double oak. My bike on the double oak cliffs. Looking back in the general direction of Clemson – far beyond the horizon! I ran out of food on double oak, so I got an iced caramel mocha for some calories for the last 10 miles home. The old AVCC country club has been torn down now. I spent many a Friday night catfish fry there! 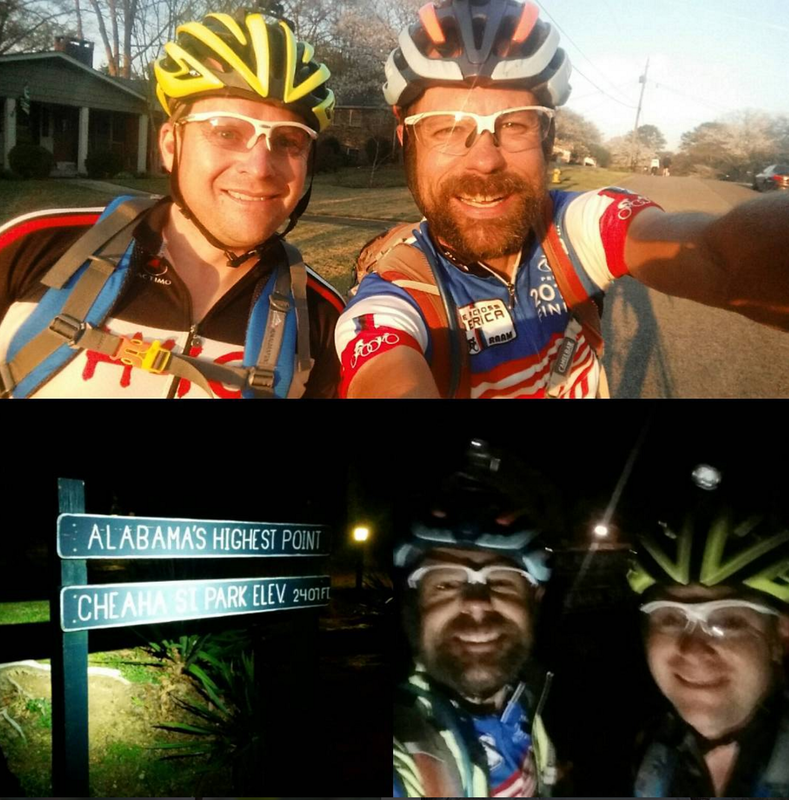 Final garmin screenshots – 114 miles from the top of cheaha to my house via double oak. 9 hours 20 minutes from the top of cheaha to my house via double oak. My ibike died in east alabama and I didn’t bother charging it again since all my other devices were running low on battery, too. The completed 378 mile elevation profile from Clemson to Hoover. Without my backpack on, 146.5 pounds. With my backpack, with no water and no food left in it, just clothes and charging equipment and tools – 11.5 pounds heavier. So I’d say with food and water, my pack averaged about 12-15 pounds for 756 miles of riding. All my stuff for the trip. Camelbak, tools, claritin and alleve, lights, garmins, ibike, powerbanks, cables, and wall chargers, two kits, long sleeve rain vest, two pairs of socks, ziplock wallet, speedplay shoe covers. 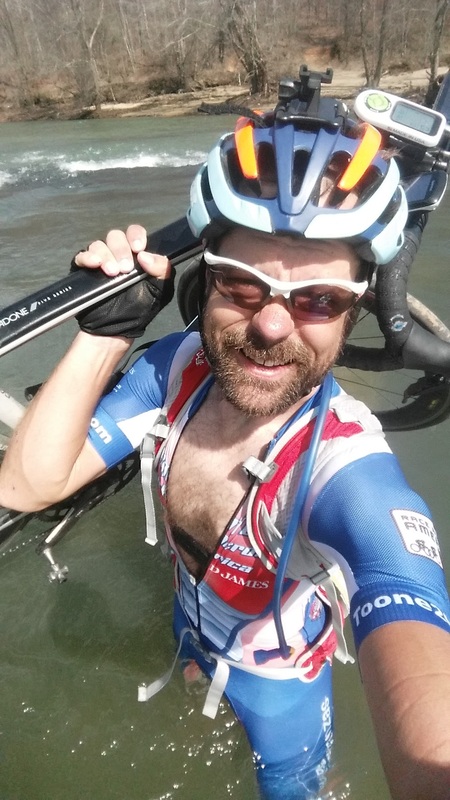 This entry was posted in Adventure, Training and tagged epic, highest point, photos, rain, topocreator on March 30, 2016 by kartoone.